Today we are going to talk about that funny etiquette rule that demands we not wear white after Labor Day. First of all, what does it even MEAN? I have never understood it, but I have blindly followed it all my life. Let's go to the books. The no-white rule after Labor Day originates from Victorian times when wearing white was as much a status symbol for the middle and upper classes during the summer, as not wearing white was the status nuance after Labor Day. The fashion nuance was that if you didn't know the rule, you weren't fashionable. Huh. Well, that makes a kind of sense. Sort of. HOWEVER, my home state is Louisiana, and although we are sticklers for the many, many rules of etiquette (I can tell you about ALL of the forks), it is so hot here that we consider anything under 80 degrees "a cold snap." Wearing white just makes the weather seem cooler, doesn't it? (If there is some scientific explanation for why black is better, I don't want to hear it.) And, as y'all might have noticed, white is also basically my signature color. So I hereby declare the no-white rule dead to me. I encourage you to break this silly rule as well, and guess what else? Tide would also like you to break it by entering their Tide VIVID White + Bright Rule Breakers of the Week Contest. The contest? Upload a photo of yourself breaking the rules of wearing white. The prize? Oh, no big deal, just a $3000 shopping spree. No White After Labor Day Rule, you are OVER! Fall bike rides are my favorite thing ever. It's actually too hot between April and right around now, early September, to ride a bike. But, check it: yesterday the temperature topped out around 90. A breezy 90. This is what fall in Louisiana looks like: crocheted shorts and a sleeveless top. Five degrees colder and I would have on a jacket and scarf. The great thing about these shorts is that even though they're white, they are texture-y enough for fall. They will also work in December with tights and boots. And I shall wear them then in that manner. Flowy tank c/o Maggie Mason, who just showcased a vintage white dress that is also about to get stolen. Shorts: Urban Outfitters. Shoes: Tsubo. Do you like this dress? I do. And I have actually broken two rules with it: not only is it white, it is also a skirt. Oops. The thing is, I am five feet tall, and the skirt is four feet tall, and I loved its interesting bottom, so it is now a dress. How perfect is it, with a light scarf, for an autumn wine tasting? Pretty perfect. Yeah, we're tasting white wine. It is hot, OKAY? Sparkly shoes go very well with white skirts-turned-dresses. Make no mistake: I wish we had cool enough weather to drink heavy red wines and make chili and gumbo, but those days are months away. So in the interim I'll be tasting white wine and wearing a white dress while doing it. PS, there needs to be a way to have gumbo cold, like gazpacho. Gumbspacho: somebody get on that. Dress/skirt: Banana Republic. Wrap: J. Crew. Shoes: Kate Spade. Sparkly bag: Ban.do. Headscarf: Vera. A thing that Southerners like a lot is the watching of football games. (We are the home of LSU and the Saints: Geaux Tigers, Who Dat, etc.) 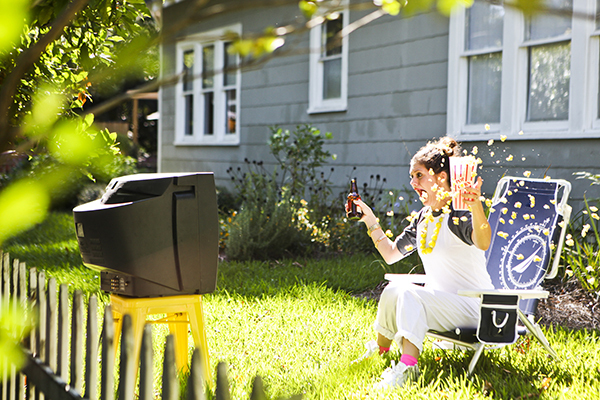 Some of us like to watch those games outside. And some of us don't have enormous flat-screen TVs in our custom-built patio areas, so we make do. And some of us enjoy making do in our white fashion sweats and silver metallic high-top sneakers. Fashion sweats: They are a real thing. Here I am contemplating which part of this is funnier: The fact that the TV doesn't actually work, or the fact that I ate two entire bags of popcorn during this shoot. GEAUX! WHO DAT! ET CETERA! Breaking the rules, drinking a beer, living the dream. Now, will you be wearing white after Labor Day? Clearly. Top: Emerson Fry. Fashion sweats: Rue 21. Neon socks: J. Crew. Necklace: Kate Spade. Shoes: Pour la Victoire. A super-special thanks to the sponsors of this post: Tide VIVID White + Bright. Now go enter that contest, you rule-breakers!